Key Perspectives: philosophy of peace; building the temple of peace; poise of equanimity. The modern corporate world is enanamoured of change. But the new corporate mantra “change is the only constant” is not entirely true. Change is undoubtedly one of the constants of life, but it is not the “only constant”. Deep behind the flowing and changing panorama of life, there are anchors of silence and stability which support and uphold the whirls of change, imaged so beautifully in the Indian mythology by the figure of Kali dancing in the prone and still bosom of Shiva. For the well-being and progress of our individual and collective life especially in the fast-changing and hyper-competitive corporate life, we must also create anchors of stability to uphold change. Without such points of inner and outer stability, mere fast change will lead to galloping stress and disorder. Inner peace and equanimity is such an anchor which can bring stability and well-being to corporate life. This article presents a path for building inner peace based on the principles and methods of Indian Yoga. One of the greatest healers and a potent source of well-being is inner Peace. Peace is the gate through which higher forces of healing and creativity enter freely and bring harmony and well-being to human consciousness and life. Peace is the most effective remedy for some of the most pressing problems of the corporate life like stress, tension and conflict. As the Mother of Sri Aurobindo Ashram points out: “To relieve tension, minutes of real calm, inner and outer, are more effective than all the remedies of the world”. (1) Wherever and whatever may be the conflict or illhealth, in the body or mind, in the inner being or outer life, if we can infuse and establish calm and peace in the spot of trouble, then slowly or swiftly things get straightened out and balance is restored. The rationale behind the effectiveness of inner Peace is simple. Peace acts like a broom or vacuum cleaner; it sweeps away all the dust, debris and filth in our mind and keeps it clean and pure. Cleanliness and Purity, inner or outer, invites and attracts positive healing and constructive forces, which are within our own body and consciousness and also in universal Nature. As long as the mind is restless, agitated and turbid, the higher forces of healing and creativity, which lies within the deeper layers of our consciousness, have no scope to come forward and act. Peace clears the way for this higher force to do their work unhindered within us. Now the question is how to get this peace. So the peace that is felt or achieved in the minutes or hours of meditation has to be maintained and extended to the whole day. In other words peace and undisturbed calm has to become an integral part of our inner nature or if that is too high an ideal for average folks like us, a settled peace has to be established in some deeper parts of our inner being, so that whenever there is a disturbance within or without we can step back immediately to that inner ashram of peace within us. To achieve this settled peace we have to supplement the traditional cross-legged and close-eyed meditations with other methods which can be practiced in the midst of work, life and action. Here also there are many methods which are available in our Indian Yogic tradition. A simple method is slow breathing. Indian Yogis found that there is a close connection between mind and breath, more specifically rate of breathing and mental activity. When the mind becomes too active or restless, if we can consciously slow down the rate of breathing and practice slow, rhythmic breathing for a few minutes, it helps to bring calm and peace to the mind. The other method is to visualize and invoke peace. The Indian Yogis, in their inner search have discovered that there is a universal Peace and Silence which pervades the inner and outer space, which creates a Zone of Peace behind our mind and heart. We can visualize and imagine these realms of Peace within us or around us and invoke it with a simple, gentle and friendly call, as if calling a friend we love or offering our self to this Peace. In the Indian spiritual tradition there are powerful manthras of Peace used by innumerable yogis and seeker and therefore charged with an inner force and effective even now. One of them is the peace chant, well-known in India, “Om Shanthi, Shanthi, Shanthi”. If we are of the religious type and believe in God, surrender to God can be a very effective method for achieving peace of mind. The discipline of constant self-giving to God, offering all our activities, problems and difficulties to Him with a total faith and trust in His Grace and Wisdom, handing over the responsibility of our Life to Him, if it is done with sincerity, devotion and persistence, can lead not only to peace of mind but also can bring the guidance and direction of a higher divine power to our life. However from a deeper psychological perspective, the true foundation of everlasting peace is a certain inner freedom from the compulsive drive of ego and desire and enslavement to negative feelings like anger, violence, greed, jealousy. For this total subjection to ego and desire is the source of all unhealthy disturbance in our inner being and outer life. Most of us are not fully conscious of this subjection. When we observe ourselves carefully we will find most of the inner disturbances come from either a hurt ego or an unsatisfied desire or unfulfilled expectation. So the extent to which we are able to reduce, minimize or eliminate the potentiality to get hurt in the ego or unsatisfied in desire, to that extent we are in peace. So when we become more and more conscious of our selves with a vigilant and constant self-observation, we will become aware of our subjection to our ego and desire and how it is the source of every kind of “unpeace”. But to achieve this spiritual peace which comes as a result of freedom from ego and desire requires a long and arduous inner discipline. However we can make a beginning by becoming more and more conscious of the nature and structure of our ego and desire and acquiring a certain amount of inner detachment and control over them, especially their grosser and more violent form. These are some of the methods and practices for attaining inner peace, which have to be taught to all the members of the corporate community, and has to become an integral part of the training programme for the work-force. The other factor which is a major source of stress and tension is the unequal reactions to the dualities of life like pleasure and pain, joy and sorrow, praise and blame, failure and success. The wild swing of moods and emotions created by these dual strokes of life is a source of unpeace, ashanthi. The antidote to this disturbance is Equanimity, which mean to remain calm, undisturbed and equal to the pleasant as well as the painful strokes of fate. But it is easy to preach and say “have equanimity”. How to do it? There are two stages in the path to equanimity. The first stage is Endurance. Here again you may say “After all we do endure the strokes of fate. What is the fun in telling to endure.” But do we really endure? We simply succumb to the lashes of life and bear it groaning and wailing. Endurance means to bear and experience the assaults of life with full consciousness, without succumbing or yielding to them, and with a will to raise beyond them. This can be achieved either by philosophic indifference of the sage or by the firm will for mastery of the warrior or by devout resignation and surrender to the Will of God of the saint. We can use any one of these attitudes according to our temperament or inclination. The second stage is detachment. As our capacity and power to bear and endure grows, it creates a bifurcation in our consciousness. While at the surface levels of our consciousness, we are still subject to the disturbance created by the dualities, some deeper, inner part in us remains free and undisturbed and detached from the surface reactions and disturbance. Once we have achieved this inner calm, equanimity and detachment, then the next step is to slowly and patiently educate the surface being, like you educate a child, to take the right attitude. This is possible because, once a deeper or higher part in us has achieved a settled inner state of consciousness like peace or equanimity, it can communicate this state to other parts. Another important factor or principle we have to keep in mind in achieving equanimity is that the dualities of life are interlinked. They are not opposites, but like the two sides of the same coin. So if we are too much attached to the pleasant fondlings of life like joy, success or praise, we cannot bear or be equal to the unpleasant strokes of fate like pain, sorrow or blame. For example, if we are very much flattered by the praise and complements of others, we can not also bear criticism. So we should not cling to or be overwhelmed by the “pleasantries” of life, if we have to bear or remain undisturbed by the hard knocks of life. In most of the wisdom-teachings of the world, Life is imaged as a flowing river which purifies. If we do not cling to anything in or offered by life, either with a negative obsession or positive attachment, the river of life washes off all negativities and disturbances and leaves us with the purity of peace. 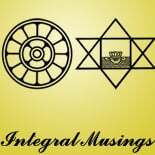 This entry was posted on May 23, 2012 by integralmusings in Integral Management.